Once you’ve purchased the long distance bus tickets for your trip within Chile, your adventure is about to begin. Signs at the terminal will direct you to the right boarding zone. Buses will have a sign in the window or a scrolling digital display with the destination and departure time. Double check both since many buses leave just minutes apart and your ticket is for a specific bus. Show your ticket to the attendant to board the bus and double check that you have the right one. You can put your luggage under the bus, just make sure you get a claim ticket from the attendant. Check your ticket for an assigned seat. Depending on when and where you board the bus, there will already be passengers filling up the bus. You’ll find room under your seat or in the overhead bin for a backpack or small bag. Your bus will likely have a bathroom, especially if it is a long distance bus. After the journey is underway, the attendant will come by and check your ticket. He will ask for your name, RUT (Chilean national ID number), and emergency contact phone number. As a tourist, you won’t likely have a RUT so he may ask for your passport or leave it blank. Ideally, you’d have an in-country emergency contact number. Use your embassy’s phone number if you’ve got nothing else. Confirm with the attendant your final destination. He will make note of that and then come get you when it is time to disembark if you aren’t getting off in the terminal at the final destination. If you’re lucky, you’ll get to watch a movie on the trip. Unfortunately, this will likely be a movie that is over ten years old. 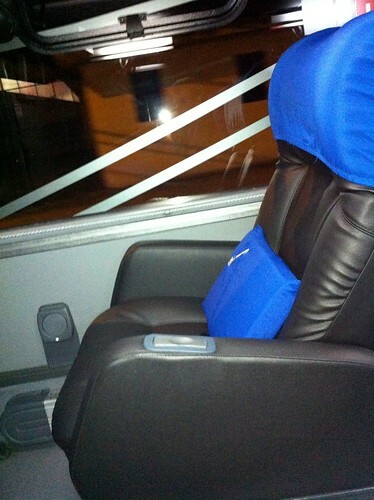 When traveling during the non-summer months, be sure to take a blanket or warm clothes as the buses tend to get cold at night. 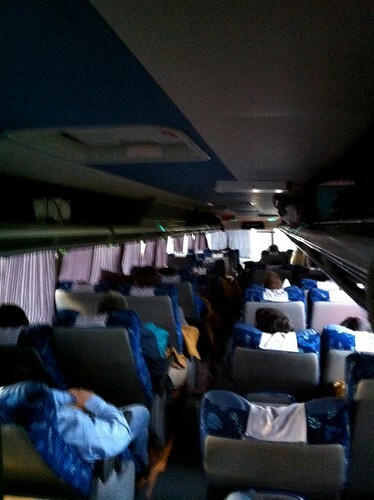 Don’t expect peace and quiet on the bus overnight. You’re bound to have people around you that are talking loudly until the early hours of the morning or a fussy babysitting right behind you. Take some earplugs or your headphones to listen to some music to counterbalance the noise. Modern buses have a digital display inside the cabin at the front which shows the speed of the bus, location, driver name, and time driven. Unfortunately, some buses will sound a loud “beep” when the driver goes over 100km/h. Expect multiple stops on the way to your final destination. People will get picked up or dropped off on the side of the highway and in towns along your route. Colder outside temperatures guarantee that you’ll wake up to the windows fogged up due to everyone’s breathing. Most buses have curtains that the attendant will close at night and then open in the morning if you don’t already do this. 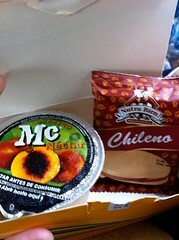 Nicer bus lines will serve you a little continental breakfast in the morning with something like a juice and alfajor.